will be the same as last year, through the Gateway Center. All Units will assemble in the area of the intersection of 400 West and 200 North, march with elegant precision south on 400 West and thence south, through the middle of the Gateway, a distance of approximately 9/10 of one mile. The line of March will terminate at the south end of the Gateway. The SIAMSA begins right after the Parade ends. To help enhance your party mood, plan on attending this unique post-parade event, and join us for a ‘warm one’ or perhaps even a ‘cool one’. 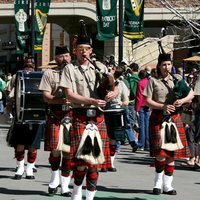 This year’s SIAMSA, to be held at the GATEWAY GRAND HALL, will feature food and beverage choices in addition to uniquely Irish entertainment such as songfests, musical entertainment and the best of Irish dancing. Visit the Hibernian Society Facebook page or Website for more details!